I normally don’t do monthly product posts, spotlighting the products I use, but with Organic Beauty Week and Organic September in full swing, I thought I would make an exception. By highlighting some brands and products for you, I am hoping to inspire you to switch one or two of your mainstream products to a natural or organic one, suitable for your skin’s needs – you might be pleasantly surprised by its effect on your skin. My product selection below comes from brands that don’t have Soil Association Certification, but I do know brand founders and trust their practises and ethics, so am happy to recommend them. Does certification matter ? The answer to this question is not straightforward and probably requires a lengthy round-table discussion with experts, brand founders and us consumers, in order for you to make an educated, conscious choice. I will go on record & say that my own purchases aren’t determined by certification alone ( I do hold Soil Association in very high regards ), but what does matter and I hope you will it take on board after reading this post, is that your skincare purchases need to be determined by your educated choice, as opposed to clever marketing practises of others aimed at you. Question is whether you actually choose to make conscious product choices when it comes to your beauty and skincare routine, as it would require extra research time on your part, or you are happy to delegate your choices to people who work on commission and don’t necessarily hold your best interests at heart when it comes to choosing appropriate skincare routine. On top of that, there is sadly often misleading information about organic and natural content of beauty products, so for those of you new to the organic and natural beauty niche, certification is there to help you feel a little less confused but don’t rule the purchase of the product out purely because it isn’t certified. I have been using some of those products since July and it would be fair to say that I think they are special for more reasons than one, hence my choosing to showcase them for you during this wonderfully transitional month, when harvesting of fruit, vegetable and flowers takes place and our skin needs skincare adjustment. Amly Silver Rich Face Mist: I had the pleasure of meeting Amly’s founders, Kerry and Lisa, this summer and have to say that I now don’t need an excuse to mist my face, with Amly effortlessly becoming a firm favourite, alongside my cult product that is de Mamiel Face Mist. Amy’s botanical alchemy mist promises to revitalise, clarify, heal and illuminate your skin, in part due to the effect of the silver-rich spring water originating from Amly, an Old English name of the wild-flower meadow located in East Sussex and belonging to Kerry’s family. Imagine a fresh spring that flows one hundred meters below a beautiful, wild meadow – that’s where this face mist has its origins. I had the pleasure of having a long conversation with Lisa, Amly’s co-founder, whose story of the brand, ingredients and aspirations was so fascinating, I stood and listened, transfixed. In many ways the actual process of creation of this face mist, blending together organic flowers, hedgerow fruit, native herbs and essential oils of Neroli, Jasmine, Rose Otto, Chamomile, Linden Blossom and Frankincense, is bound to make you dream of all the good things that surround us, but at times we fail to notice & appreciate. It also highlights seasonality, respect of nature and dedication to the craft of creating a potent product that will make a difference to how your skin looks and feels (it might also have a positive effect on your mindset, as an added bonus). Lisa and Kerry also added Marine Algae, known for its Hyaluronic Acid boosting properties, in order to help enhance your skin’s moisture levels (the effect is noticeable during travels and holidays in hot climate, as this mist has been my faithful companion throughout my August travels in France and Spain, be it by train, plain or car), as well as nourishing plant probiotics, skin-perfecting Copper Peptides, detoxifying Himalayan Salts and harmonising Rose Quarts. I carry it in my handbag and use it liberally on the tube, when I am driving or when I am working at my desk and need a pick me up. Inhaling its scent takes me back to long country walks that I love, trying to decipher mist’s composition like a wine connoisseur would interpret the wine. You can prep your skin with it, you can mist it over the make-up or even use as light perfume – whichever way you use it, you will fall under its spell, irrespective of your skin type. This is one of my beauty keys to reviving a tired or stressed complexion or just soothing frayed nerves after a long day or stressful journeys. A simple but somewhat precious product for your bathroom shelf, desk or bedside table. Tata Harper limited edition Honey Blossom Mask: like Pooh Bear, I am drawn to honey, be it for boosting my immunity or using it to nurture my skin and lips. This mask from one of my favourite US natural beauty brands, has been on my beauty want list since it appeared in Tata’s US shop, so imagine my delight when some stock arrived at Content and I dashed to get my hands on a precious jar, sealed in the old-fashioned way, pretty much as soon as I returned from my summer holidays. What can you expect from it? Smoother, glowing, radiant skin. Tata re-worked one of her cult products ( the Resurfacing Mask ) by using Vermont-harvested raw honey, which gives skin a boost of hydration and helps to refresh the complexion, particularly when you feel tired and your skin looks somewhat dull. Smelling this mask, which has gorgeous floral extracts at its core, will make you feel like summer never ends in the sanctity of your bathroom. Then you notice that pores become smaller and redness is reduced (if you are prone to it) and you might start reminiscing of the summer holidays, when less is definitely more when it comes to skincare routine, yet we all love the look of our complexion in the mirror. Masking for me is about nurturing my skin, giving it an extra weekly boost with ingredients that it needs and this mask, with its 11 high-performance ingredients, delivers in spades. In the midst of autumn harvest time, when you can still see hard-working bees flying around, just take the time to notice the autumn beauty and smile a content smile, as you apply this mask to your cleansed skin, gently tapping it in with the tips of your fingers for some added facial muscles boost. You can also extend it to your neckline and decollete, particularly if you favour off the shoulder tops and dresses. 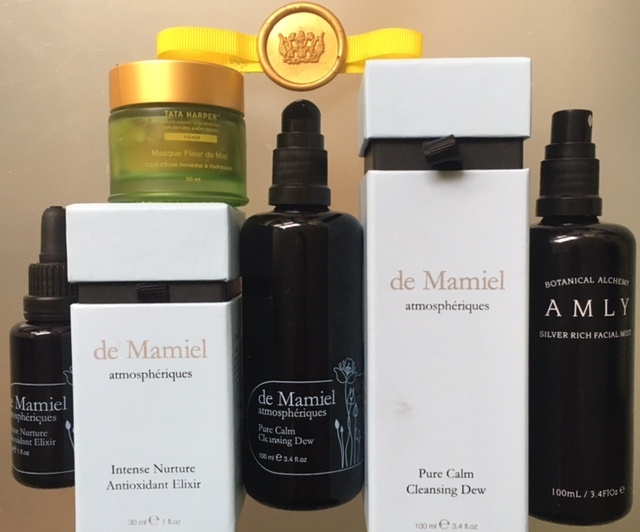 de Mamiel Atmospherique duo – Pure Calm Cleansing Dew and Intense Nurture Antioxidant Elixir: this range has been one of the most wonderful summer discoveries for me. I had the pleasure of talking to Annee about the addition of this trio of products to her range and she surprised me when she said that developing them took her into uncharted, unexpected, exciting waters of new discoveries. ‘Environmental stress from air pollution, UV rays and electromagnetic radiation from our digital world is stressing our skin without us even realising. Every day tiny nano-particles of pollution are released into the air, infiltrating the epidermis and interfering with the DNA, proteins and the normal function of the skin. In addition, HEVs ( high-energy visible rays) from the screens that surround us daily can penetrate the skin, causing oxidative stress. Like a dirty window, the skin gets blocked and marginalised, causing inflammation, sensitivity, lack of moisture and radiance and ultimately, premature ageing’. It took Annee five years of painstaking formulation and testing to get to this point and she beamed when she told me that this range will help support not only your skin, but its repair process. Annee also took a new direction in her product development, with the focus still on natural beauty, but making sure her products help service your skin needs on a more superior level than before. She worked with eco-certified ingredients and made sure that she improved products preservative system. She also introduced new ingredients like Ferulic Acid, a third generation antioxidant that helps to protect and repair your skin. She also created a proprietary blend that is incredibly potent. de Mamiel Pure Calm Cleansing Dew, £50/ 100 ml: this product will come particularly handy to those of us who live in large cities. This calming oil-to-milk cleanser (it has an incredibly sophisticated texture, that feels like the lightest silk in the palm of your hand) is infused with a proprietary blend of 14 organic herbs ( including the growing in popularity Blue Tansy, Cape Chamomile, Fragonia, Rosewood, Cypress, Frankincense, Lavender, Grapefruit and Geranium ) that work on the prevention of formation of free radicals, premature ageing and protecting your skin from daily pollution. It works for all skin types and helps to calm redness, sooth irritations, while thoroughly cleansing your skin from impurities and lifting even heavy make-up off your skin effortlessly. To cleanse the skin morning and night, apply a few pumps with slightly damp fingers to your dry skin, taking time to inhale the aroma, which will help you release emotional baggage – just make sure you take full breaths, helping re-oxiginate your body more effectively as you do so. Massage the oil into the skin and think of the barrier function of your skin being boosted. Then add a little bit of warm, but not hot water, that will turn the oil into a gently caressing the skin milk. Blackcurrant Seed Oil and Sunflower Oil, rich in Linoleum Acid, are tasked with strengthening and regenerating of the skin barrier, Phytosterols will reduce inflammation and Ferulic Acid is a handy antioxidant to have in your arsenal any time of the day. Rinse the skin thoroughly, pat dry with a cotton cloth or towel and follow up with the Elixir or any other products that you normally use in your skincare routine. Annee also told me that this product is great for shaving. This Cleansing Dew is a truly stand out product and its gentle efficacy does highlight the difference between average mass products and superior niche ones. It also helps to remember that from 30 onwards we all start to experience cumulative effect of pollution, so this is a great ‘skin armour’ product all year round. de Mamiel Intense Nurture Antioxidant Elixir, £80/100ml: Now, let me start by saying that I haven’t tried a product like that before – and by that I mean it is THAT special. It really takes you by surprise with the first application and after a few weeks I asked myself how I lived without this. During my conversation with Annee she admitted that somewhat selfishly she designed this product for herself in a way and now that the product is on her bathroom shelf, she puts it on twice a day, saying that ‘it rocks’. Acting like a ‘protective cocoon for your skin’, this antioxidant rich super serum has a very light texture, like a lotion with a little bit of a powdery texture and very silky undertones. Annee packed quite a punch with ingredients when creating this serum, adding Superoxide Dismutase and Malachite – both ultimate antioxidants, which help the skin deal with extreme oxidative stress caused by HEVs, mentioned above. You will also find Marine Saphire in the list of ingredients, which helps to increase cell renewal and skin oxygen levels for a brighter complexion. On top of that you have Ferulic Acid Esters, which purifies the skin from the negative effect of heavy metals present in the air we breath and protects from urban pollution in general, while Hyaluronic Acid and Ceramides elevate skin’s overall hydration levels. So with each use you will notice a change in your skin, so much so, that some of my girlfriends asked me if I succumbed to Botox. The answer was an honest ‘no’ and a revelation of the name of this serum responsible for such effect on my skin. I kid you not, it really does make your skin look younger.